For the last few months I've been subscribing to a baby magazine called "Your Big Backyard"
It's a great magazine that has LOTS of fun and interesting stuff. 1. "What's that?" It's a one page with a picture of an unusual animal. There is a name of it, pronunciation and a short fact about it. 3. Game that is related to an article. Game can be introduced later as Eaton's age is too young to follow that kind of directions. 5. "Ever wonder?" It's a one page of fun fact about animal. Then there is a little game. Example: "Find 5 things wrong with this picture". 6. One page story for a baby to read. Soon Eaton will be ready for it. 7. Big poster inside the magazine. 9. Backyard Buddies: Art gallery. It is one page of art that kids send to that magazine. 10. Ricky and Pals. 4 page story about 4 buddies. In probably 6 months Eaton can read these stories. For now I read them to him. 11. One page Family Fun. 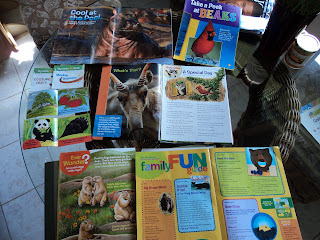 This section includes short animal poems, songs and recommendations of books for kids. 12. Crafts section you can do with your kid, some easy kitchen recipe. 13. Outdoor section includes ideas what you can do with your kid while you exploring outside world. It looks like lesson plan for a day. I like it a lot! 14. "Explore the big outdoor". Another type of animal facts: one page and animated picture. Overall this magazine is FULL of FACTS and new vocabulary for your baby. Eaton really enjoys that magazine. I was surprised when he was answering questions for one of their games. This is how I use "My Big Backyard" magazine. Whenever I receive subscription, I read that with Eaton. I give him some time until next magazine shows up. Then I cut out each section that is full of facts: mini books, articles etc and I sort them out. 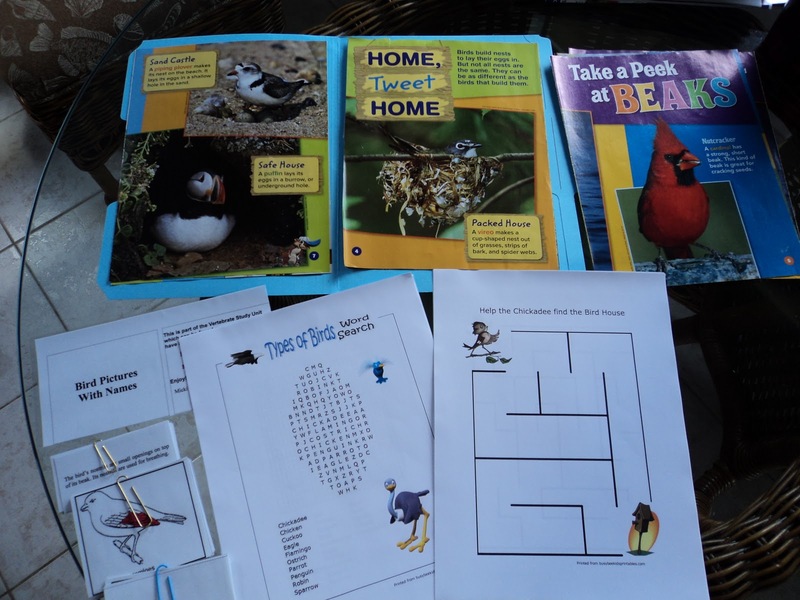 Example: Here is a picture of a folder (I didn't put it together yet) about birds. As I plan to homeschooling Eaton using Unit Studies I found that this idea is just perfect fit. I collect everything about birds. Articles from "Your Big Backyard", Montessori cards, word searching, mazes etc. all that are related to birds. I plan to introduce it slowly from the easiest plan to more advance. Example: Eaton is not ready for word searching or mazes yet. We will be working progressively and I introduce that later on by adding to a folder. All posters from that magazine I put on a wall for one month. Eaton likes that idea too. Here is the video of Eaton reading rhyming poem on a poster about flamingos.